Attention!!! Do not try to test an Expert Advisor in Tester, this is simply impossible and meaningless, since the principle is based on pair trading, that is, the robot opens two positions at once for different instruments. The tester is able to test only one pair. Therefore, a separate real account is attached to the product, where you can constantly monitor all trading results: https://www.mql5.com/en/signals/491066, which is much more convincing and weightier than any tests, and demo results! and for the second pair - for additional. It uses several factors to entry in the market, and also calculates a multi-directional divergence in the correlation pairs and, when a signal arrives, opens only one ligament (two correlated of currency pairs). Next comes the calculation in the course of the open pairs and, if necessary, adds orders (also with a pair/ligament, for complete hedging and minimizing the drawdown), but not more than 3 per currency pair. But, even if the open correlation pairs will continue to diverge, for security, the adviser will open another ligament of pairs, but with currencies completely different from those used in trading. With the default settings, the adviser will trade 8 pairs: EURUSD, GBPJPY, GBPAUD, EURNZD, AUDCAD, NZDCHF, NZDJPY, AUDUSD (minimum deposit with default settings: $500). Set-N2_for_Twin_HEDGE_DC.set - for trading additional 8 pairs: AUDJPY, NZDUSD, NZDCAD, AUDCHF, EURAUD, GBPNZD, GBPUSD, EURJPY. Set-N3_for_Twin_HEDGE_DC.set - for trading additional 8 pairs: AUDNZD, CADJPY, USDCAD, USDCHF, EURCAD, GBPCHF, GBPCAD, EURCHF. Due entry into the market with correlation pairs, the system is not afraid of any sharp (long-term) movement, a similar method of hedging minimizes drawdown. Even if a drawdown is formed, a other of twin whose currencies are completely unrelated to the drawdown come into operation. Slow and steady. Good EA and helpful Stanislau. Now starting with this EA. Already live with the Maxed Mixed Hedging EA based on experience with this. I am confident in using this one too! I bought this EA because I have much confidence in the developer Stanislau, he is supportive and provide good updates to make the system even better, low DD makes this safe to use, exactly what I was looking for. My second EA, 1st day on live, 2 baskets closed. Just installed today. Great support from the developer. Thank you. Great EA. Everything is working fine so far! Thanks a lot! Twin-Hedge EA is the second one I got from Stanislau. It is very reliable with low DD and profitable as well. I really like this EA. Profitable with low DD. Author is helpful and responsive as well. I have tested the ea for the past two months. Now i am running the ea in real account. The result so far so good. Very great EA! I'm running it on a demo account and the results are like expected :) I think I'll start live from January 2019. I am running already in Live account. Good support from developer. Very good EA! The developer is always very responsive and helpful whenever I have any questions. I've been trying this ea vs Max hedge for a month now on live accounts. Both are really good, this one has less drawdown and both systems are profitable. Highly recommended, compare to the Max Mixed Hedging DC, this version has a better return to drawdown ratio. definitely a buy. helpful author with extended support. going good so far on real account. cheers. Great EA. Good support. Exactly what I was searching for. 1. This is a very large-scale update for Twin_HEDGE, with a global modification of the trading algorithm and all the trading logic. Absolutely innovative concepts and methods of interaction of correlation pairs in pair trading using hedging have been introduced. 2. The principle of trading has been changed, now all bundles can trade at once in a set if there are signals to enter. 3. Added a MA filter that allows you to fine-tune trading style. 4. Modified and advanced function is integrated for use in the trading of the balance part. Now you can also set the part of the balance (in%) that the EA will use when trading. 5. Information about the loaded (used) settings file has been added to the panel. 6. Information about the used Twin_Max-Mixed_DC money for trading has been added to the panel. 7. Replaced all the MagicNumbers in Set-N1, since they coincided with Max-Mixed_Hedging Set-N1, which caused inconvenience when using all the advisors on one account. 1. This is a very powerful update for the logic and trading algorithm of this advisor during periods of drawdown. The mechanism of interaction of ligaments for unfavorable periods has been completely modernized and reworked, using a multi-level alternating tactic of opening a new ligament at achievement of a certain number of orders in trade of absolutely other ligament. 3. Added a currency direction filter, which more accurately determines the degree of divergence of the correlation pairs. 4. For each correlation ligaments, a button was added on the panel to close all pairs in this ligament. 5. Added a button on the panel to Close ALL open orders. 6. Added the ability to ON / OFF opening positions for each pair directly from the panel (green / red indicator). 1. Added the ability to change comments to orders. 2. 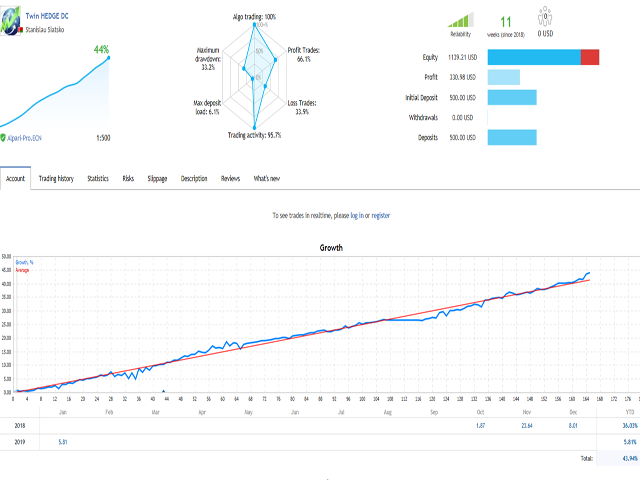 The trade algorithm has been further improved for even more accurate market entry and minimizing drawdown. 3. Changed the structure of currency pairs for each of the 3 sets. Selected the best possible ligaments in the set, allowing to hedge the trade of each set with the most different currencies. 1. This is a special update to automate the process when replacing work pairs (when it is necessary). You will not need to change anything manually, it will be enough to install the updated Set, with new pairs. Also, it’s not necessary to wait until the orders will be closed for the pair we are changing. All open positions on the modified pair will be transferred to the Expert's buffer and will be taken into account when calculating the profit and be fully accompanied until full closure. 2. Alert On/Off is corrected. 3. The wrong message which appeared when closing positions is eliminated. Fixed parameters in the settings when using the default. 1. In order to avoid a major user error in trading, a protection has been added that checks whether all work pairs have been added to the Market Watch window. If not all pairs are loaded, the Expert simply will not work. 2. Since all pairs behave differently and move with different forces, the coefficient of force of movement of currency (Power_Ratio) was added for each ligament, which significantly balances the presence of all pairs in the trade. 3. Improved algorithm and conditions for more accurate entry into the market. 4. Improved algorithm and conditions for tracking open positions, as well as for adding new ones, which allows more reduce the floating drawdown.